I'd like to start off by saying a big thanks to all of the organizers and all of the volunteers that put in the work to let us have as much fun as we can in a safe environment. 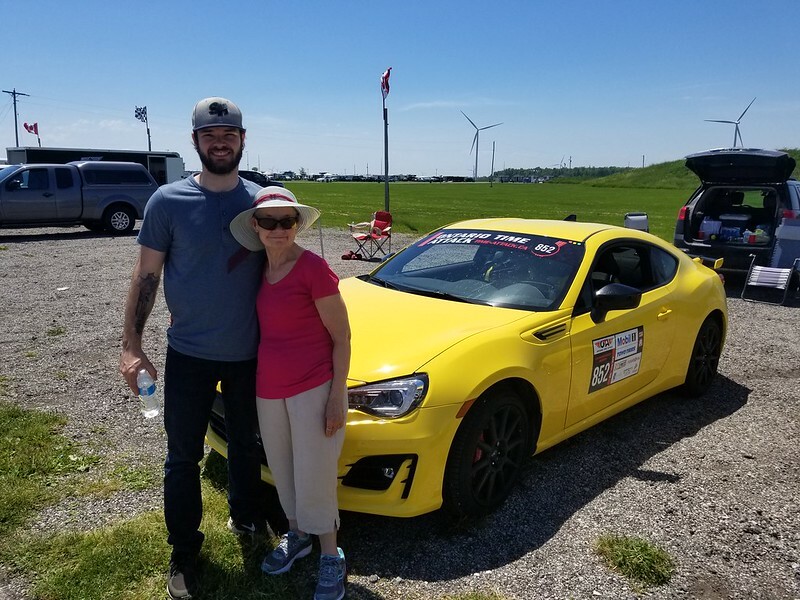 For those (pretty much all of you) that don't know me, I'm Jake and I "competed" in the GT4 class in my 2017 Subaru BRZ (the bright yellow one). The competed is in quotations, because while I raced and made lap times. I think I placed above last once in the 5 events that I attended. I went car shopping with the intention of buying a track friendly car, something that wasn't going to kill me with its speed, or insurance rates. Obviously the answer was Miata; but I'm a Subaru fanboy so I settled for the flat-foured counterpart in the BRZ. Shortly after purchasing the BRZ I looked into which racing I could do with it, local autocrosses, OTA, and CSCS. I chose OTA because honestly it seemed much less intimidating. I knew that because I had no track experience I needed some instruction, so I signed up for the OTA school held at Mosport DDT. I honestly don't remember my instructors name, James I think. Like many others here, I can tell you what he drove; BMW135. Regardless, his comments and suggestions gave me the confidence to push myself and my very new car to the limits and learn a few things along the way. That school showed me the type of people that I would be spending my weekends with as well. People who are willing to help others at a moments notice, people who will offer sound advice when needed. It's a nice change from the motocross scene, where people are a little more self-centred. I told myself (and continue to tell myself) that I needed to maximize my driving behind the wheel of the car, before I could touch anything on the car itself - including tires. I figured that they wouldn't help me that much anyways, as braking and turn-in points for me are still something to grasp accurately and consistently. The stock Michelin Primacy HP in a 215/45R17 were much worse than I expected, but for me they were perfect. I'm still trying to figure out the rules and how the point system works (PAX? Is that what it's called?) And I'm trying to figure out how to best optimize my car without having to do any major modification; ie. grip, brakes, and aero. While still remaining in the GT4 class. All in all I had a great year with OTA and I'm looking forward to competing with you guys in the future. Really happy to hear you enjoyed yourself Jake! I remember following you at DDT during the lapping sessions. Yellow cars unite! I strongly suggest getting more coaching to keep up the learning and don't worry about finishing last. As long as there is improvement, its satisfying and eventually you will break out. The BRZ is an insanely good platform to learn from and you will get better. Cheers and hope to see you at the banquet! Sounds like you had a fantastic year! The best place to start from is the bottom! While I don't run with OTA anymore, I certainly spent a number of years there. Some great friendships were made with other drivers who, along with me, were at the bottom of the charts. That also meant that we were gridded with each other at every event. The great thing is that none of us stayed at the bottom and we moved all over the map. For quite a while I was an instructor and even a couple as chief instructor. So keep involved. Keep driving. And who knows what you'll be posting in a year or two! Nissan NX1600 - classed in T3, and T2 ... T1 the GT4 and eventually SGT2. While I think that's where I ended, the NX would likely be in SGT1 or Mod something or other now. Very proud that my daughter was faster than me in my own car ... and I think still holds a few records in T3. Including Mosport GP before the runoffs were paved. Frank - OTA #259 retired. I'm in BC now! OTA is a great place to do things that you only dreamed of before. You don't need to spend the money needed for wheel to wheel racing, you don't need to worry about car to car contact, you don't need to spend megabucks on your car to have fun, but you do get the drive the beejesus out your car without the worry of pedestrians, traffic lights or the long arm of the law. The competition aspect just puts the icing on the cake. Most people who play golf keep score and those of us who play hockey will tell you that a game is more intense than shinny. OTOH, none of us are likely to be positioned to oust James Hinchcliffe from his ride so there is no need for the competitiveness to get out of hand. I really believe OTA has the right balance of fun speed and safety in an easily accessible environment with friendly like minded folks. Hey Jake, we probably have never met but I started tracking my car a few years ago with OTA and I can totally relate to your story (my mom even visited me one time as well, but I don't think she wants to come out and take a ride in my car). I learned a lot through OTA and made many track friends. Glad to hear you had fun. At end of the day this is why we do it ("it" defined as turning money into noise through production of pollution). I love the BRZ/FRS and would have bought one if I didn't have the Civic. As others mentioned a great platform car wise and a great series to learn from! I can't stress the importance of instruction, I have Corey not only instruct me, but also drive my car a lot so I can learn quickly to find the limits..
best money spent is on seat time and instruction. Our series is growing and becoming more exciting every year, folks like yourself who bring enthusiasm is awesome! Jake, thanks for the great post. We all started just like you did and benefited from the help we got along the way. You have the attitude and car to do very, very well if you stick with it. I hope you do. Best 1st step to take is to upgrade your tire/wheel selection. I look forward to running with you next year. as this year was my first time competing in OTA it was great seeing another fellow FRS/BRZ to run with! hopefully next year you can make the jump and join us in the very tight GT3 pack! To bad due to reliability I was not able to finish shannonville with you , you were driving that car to the limit and your left front tire truly showed that ahhaha ,I personally enjoyed running with OTA very much , super organized , scrutineered very well , vehicles classed very close and lots of fun and competitive! I was only able to do half the events but next year im running every single one! I'm definitely going to take the advice and get some more instruction, there is always room for improvement. I'm also looking into getting a lap timer for when I'm doing my own lapping. The only upgrades I'm looking to do to the car are tires (235/45R17 R888R- if they end up being 0 PIP) I've also heard of people running as wide as 255 on stock suspension on these BRZ/FRS's but also saying that they are slower than a narrower tire. I'm also planning on running a better brake pad, and better fluid. I only really experienced brake fade at DDT, but I'd rather just be safe when running out there. Also thank you to all the organizers of the banquet! Food and company were great, looking forward to next year! I could've sworn Tire Rack did a tire test on the BRZ but not sure if they compared widths as opposed to a bigger radius tire. Both your car and mine are very similar so let me know if you have any questions! I am envious that your car comes with a square tire size setup compared to my factory stagger... argh more money to spend on wheels. CSG has a lot of data posted on tire testing... at stock power they found a 225/45 is faster than a 245/40 (same tire/compound), BUT that's on the specific track(s) they tested at. I would bet that at the DDT a 245 is faster, and possibly SMP full as well. I've toyed with the idea of running staggered myself, but there is real no benefit to me. When it comes to brakes, I'm not sure if I'm going to go to an aggressive street/track pad, or if I'm just going to get track specific pads and swap them in before each event. I found an article by Road & Track that compared stock, to a stickier 215, to the same brand 235. The 215 was faster. If you're getting a second set of track tires, it's not much more effort to swap in track pads at the same time. Keep right except to pass. Depending on how much you drive the car daily, and your tolerance for noise, you can easily daily drive more aggressive pads as well. I daily drove project mu club racers before, and G-Loc R10's this past summer. They're not quiet, but they're not terrible either. I daily drove project mu club racers before, and G-Loc R10's this past summer. They're not quiet, but they're not terrible either. G-Lolc R-16's are cement mixer about to crash into a dump truck loud. But they work quite well on track! I've had no luck getting recently produced PF11's to set up right even on fresh rotors, so they've been stupid expensive for no real benefit. The G-Loc's have been a great deal with their longevity and lower price. Www.ewaldperformance.com Frank has great group buy pricing in the spring.